Bile and Bibles: turning the other cheek for my duct tape. I have a interesting relationship with the Bible. By interesting I mean aggravating. It mostly comes from my own inability to devour it in a day and tick it off the list (have I mentioned the virtue of patience is one I am not especially blessed with?) So at the start of this journey I would happily read anything else related to Christian research in a vain attempt to somehow circumvent the need. Part of the frustration stemmed from my being a speed reader blessed with ease of comprehension. The gift means I can gobble up most books and analyse their contents at speed. The Bible, however, is another matter. It defies devouring. A passage you read one day can impact only slightly, whilst a month later it smacks you around the back of the head with blinding insight. Yet I have had to get to grips because the Bible turns out to be a rather useful ‘back-stop’. The catcher. For those days when I wonder if the shoving in my head is God or simply my over-active imagination. As my footsteps grow stronger on this faith walk, I’ve developed relationship and faith enough to sense the difference – but on the days when my God-frequency goes on the fritz, or I suffer from personal maudlin terror (PMT), and I can do little but mutter the Lord’s Prayer in a slanging sort of way, throwing open the Bible and seeing what my eyes are drawn to helps. I ought to write to the developers of The Bible app with a suggested upgrade: shake device to shuffle random Bible verses. I do take a slightly more methodical approach to scripture than ‘flip n flurry’ – I could not make head or tail of this past year if I didn’t. This is where the internet is both curse and blessing. Blessing because technology has delivered Bible apps with beautifully-voiced narrators that make listening to it a joy. Curse because it’s way too easy to type into Reverend Google: ‘Bible verse about xyz’ and get a fast answer. Read all the Bible? Between google and my eidetic memory for snippets, it’s tempting to skim. Yet skimming for sound-bytes gives rise to much that is lost in translation when it comes to G&J today. Clobber verses taken out of context are not useful. Like recently, when an atheist reader of an earlier blog suggested I keep my female faith opinions to myself. He posted to me this image of a bound and gagged woman, referring to a scriptural passage about women needing to be quiet. Thank you. 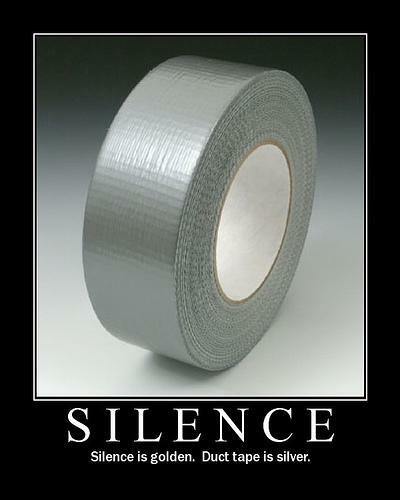 Let me turn the other cheek so you may stretch that duct tape across my mouth more easily. 1 Timothy 2:11-12 is a useful clobber verse for anyone who wants to punch Christianity for being behind the times on gender equality. Yet with a better reading of The Bible, and perhaps accompanying it with something like John Dickson’s Hearing Her Voice, my critic may have recognised the difference between apostolic teaching from the early church and today, given apostolic teaching has been preserved in the canon of New Testament scripture. So Dickson writes that while the first generation of Christian women were prohibited from laying down foundational, apostolic teaching which would become doctrine, tradition, and, finally, scripture, once this doctrine had been preserved in Scripture, women may teach it. Seems I can ignore the duct tape for another day. And keep on digging into that pesky, Holy text. ← Jaysus. There’s three of them?